Is keyboard-packing new tablet the best of both worlds? Samsung's new slider tablet TX100 - the best of both worlds? Samsung has announced its new 'slider' tablet PC, the TX100, which the company hopes will provide the benefits of both a notebook and a tablet PC. Samsung's TX100 is essentially a touchscreen tablet PC running Windows 7, with a slide-out keyboard, for those users who prefer the good old QWERTY input on occasion. Perfect fit for your digital life? It is, according to Samsung's press release "the perfect fit for creating and consuming content, whatever your digital lifestyle." 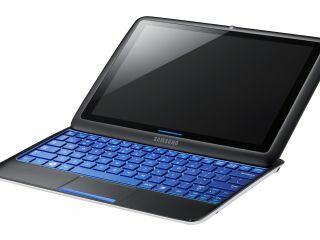 "Equipped with Microsoft Windows 7 operating system and powered by the upcoming Intel Atom processor platform, the Samsung TX100 maximises the benefits of a tablet PC with its compact, light, and easy to go design, as well as features that provide easy typing and enhanced productivity and performance. "The display elegantly slides up and out to reveal a physical keyboard much like that of a typical notebook. However, it has the ability to use the intuitive touch display, keyboard and mouse interface as well." "However, when the display is slid into place, it reveals a physical keyboard, giving users the freedom of an intuitive touch environment and a familiar keyboard and mouse interface. The transformation of form-factor is slick and seamless. Bringing such an innovative and new device to market is an example of Samsung's dedication to taking care of peoples unmet needs." Steve Guggenheimer, Corporate Vice President of the OEM Division, Microsoft Corporation adds: "The Samsung TX100 is a great example of the deep collaboration between Microsoft and Samsung, from engineering to marketing. "This joint innovation delivers a unique PC design and rich mobile computing experiences for our mutual customers." Specs wise, the Samsung TX100 features a 10.1-inch multi-touch LCD display that supports HD resolution (1366x768) and outdoor visibility (340 nit). Samsung is hoping that the TX100's screen size is "great for immersive activities like watching movies or social networking" while "in the business environment, the TX100 is just the right size for a salesman giving a presentation to a client, a construction worker viewing blueprints, or a medical professional searching for information on a patient." Sammy's press blurb continues: "The device is ideal for students in an education setting because of its handy, portable nature and focus on content." We should have UK pricing and release details shortly, so stay tuned for those.